Yes, it will be decorated similar to Galileo s beauty, in a simpler manner. Will post pics with when there's visible progress. Today, the objective and eyepiece ends were sanded down and given a coat of satin black paint as a base. The experimental covering for the main tube was started, part of it glued on. I think it will work. Far cheaper and easier to work with than Cordovan leather. I wish I had seen this before I picked up a Zeiss Ikon 1.0 diopter and a Nikon Nikkor 0.7 diopter close up lenses. They weren't very expensive and maybe they will test better. I also ordered ten 38mm x 1000mm DCX lenses from Surplus Shed yesterday for a whopping $5. Hopefully one will test well enough. Please, if anyone else has made, or is thinking of making a Galileian scope,or any other retro-experiments, please add your remarks here! And pics of your scope! Aha! Let us know if you also think that such product is a pretty good flat dark black. Only now I realize that you opened a specific thread on the topic, after your inquiry I was still waiting for your posts on the other thread! Keep sending out updates pls..... it sounds like you are having a good time. Yes, I think the Stuart Semplr flat black is ideal for scopes. I don't see 5hat it's much blacker than the ultra flat spray paint. But the inside of a scope is a 'low wear" protected area. The acrylic is thick, with a high ratio of pigment. I taped a small soft brush to a chop stick and applied inside the 1.23" tube from both ends. No fumes, easy clean up and quick drying. This jar will go a long way. After reading Suiter's most interesting paper, I realized even more how unfortunate it is that Galileo never tried a Keplerian eyepiece. Compared to the Galileian eyepiece, the Keplerian is orders of magnitude easier to use on long focal length instruments, as the field doesn't depend on the f/ratio of the objective and has a real exit pupil, which makes for a much better defined field stop. This makes it vastly easier to use higher magnifications and also easier to install baffles in the telescope tube. The apparent field is around 15°. 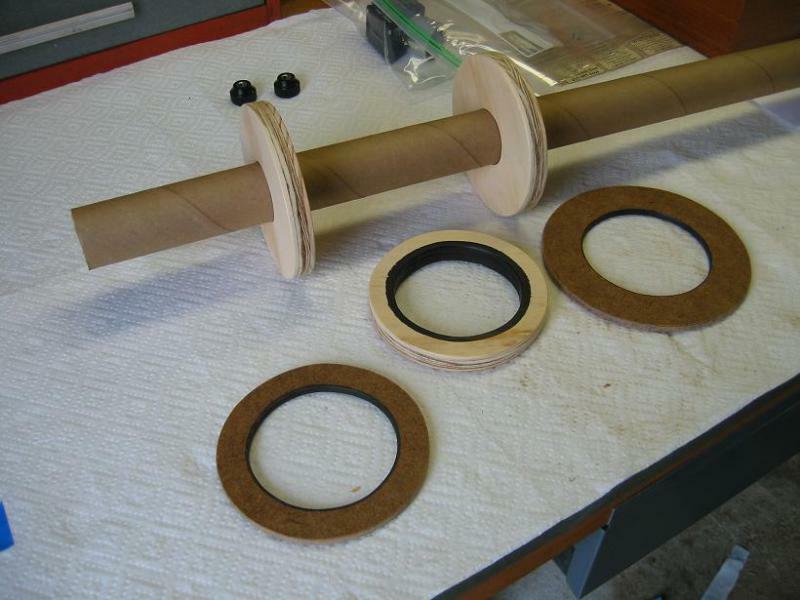 I encourage everyone that makes a copy of one of Galileo's telescopes, to also make some Keplerian eyepieces for it. From Suiter's paper there is the following table about the specifications of Galileo's surviving instruments. Suiter argues in the paper that the breakthrough making telescopes possible, and suddenly widespread was the aperture stop that converted the bad optics of the day into serviceable ones. Galileo's were definitely aperture stopped at both ends, by this table. So in recreating Galileo's instruments it seems like you should be aperture stopping them similarly, or make that optional to show what he had to work with vs our lenses. And it shows that, yes, our lenses are vastly better than what Galileo could make. Edited by careysub, 24 February 2019 - 04:26 PM. For further information on the topic of the earliest telescopes I recommend reading "The Long Route to the Invention of the Telescope" by Rolf Willach, American Philosophical Society, 2008. Living in Switzerland, he spent a number of years testing early spectacle lenses in monasteries, museums and private collections all over Europe, and his book describes the progression of spectacle lens fabrication techniques used over the centuries leading up to the sudden emerging of the telescope virtually overnight. The key was the aperture stop. So easy to see, it didn't remain a secret very long. I believe that Willach is the first to speculate that the real "invention" was the aperture stop, and in a talk of his in the Netherlands at a conference in 2008, he set up 16th/17th century spectacle lenses in a Galilean arrangement on an optical bench looking at a target across the room. Attendees would look through initially at a quite distorted full-aperture view that sharpened dramatically when a stop was pivoted into position. Pretty convincing demonstration. Thank you you Roger ,Ken, Carey and Robert for the great resourses! I downloaded the articles and will be reading them between bouts of ATM. The scope construction is coming along nicely, and I will post a pic or two when the covering is finished gluing onto the aluminum tubes. It's an engaging adventure over many areas. All the timings were just right for a brilliant man to make what he needed to open up new worlds. I feel a tractor beam reeling me in, Oh no I have too many irons in the fire. This is very interesting subject. There was a Galileo-type telescope set up on the Hartness House lawn doing solar projection at Stellafane a couple of years ago. It was pretty cool. Aw, it doesn't have to be iron, Robert! Give a couple pvc or aluminum tubes, some plumbing bits, and SS lenses to your assistants, and they'll have one together in no time. My bet is you could find the optics you need in your Edmund stash! My assistants are willing and able, and just as perky as me about Galileo. It's fascinating how much information is out there about Galileo and his telescopes. are excited about a new project. I have an extra 38mmx1000mm pcx objective. Would that help? Yesterday, I puttered inside with painting the ota, reading, and sorting lenses. A fun way to while away a rainy afternoon. I'm going to wait until I have fewer pots on the stove, it's crazy around here. I love it when it's crazy though, I get scared when I flounder. I need a steady flow. 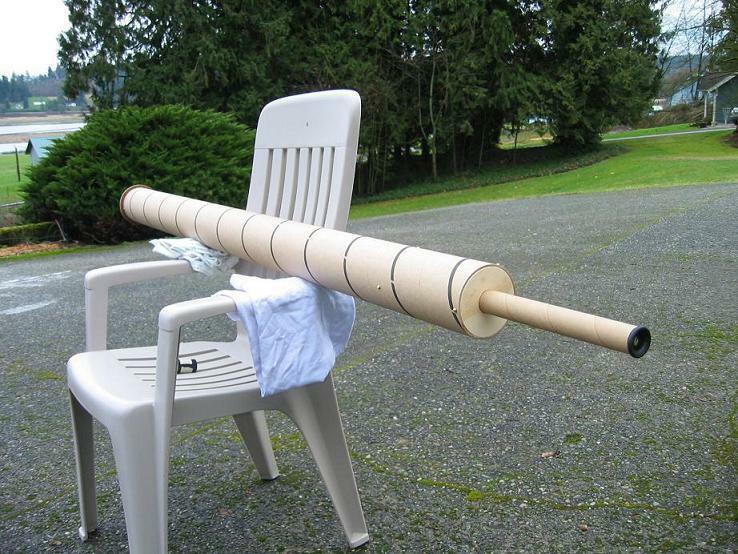 I will post a picture of my Gallileian scope replica later tonight. Looks finished to me, if it works. Oh you mean to pretty it up? Pshah, you mainly use it in the dark. Yes I thought I'd varnish it with a clear marine varnish. the focus will be sticky. daytime terrestrial which I did note in my link provided earlier. Edited by clamchip, 27 February 2019 - 05:32 PM. Spent a bit of time on the OTA yesterday, having much fun with the trompe l'oeil process. With all our rain and clouds, the decoration gives me something to do while waiting first light. I did find a 1330 lens for a companion scope ( in the plain brown wrapper). looks like a motor tube and centering rings in any one of my high power rockets. Maybe check out a local hobby lobby for the focuser?